Made in Alabama by Bear & Son Cutlery, this pocket slip joint folder shows that, even with simple knife styles, the people at Bear & Son take time to think. 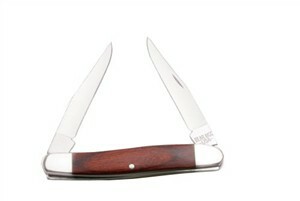 Four inches long when closed, this sleek pocket knife holds two clip point blades nearly identical in pattern. Owners of dual blade knives already know the routine -- the factory ships them both with the same edge grind, and you change that with a couple of hours of careful work with a whetstone. Give one blade a thin edge for the razor sharp applications, and the other a wedge edge for the coarse work. The Bear & Son 4-inch Rosewood Muskrat knife comes already customized with a main blade that's hollow ground and a flat ground backup blade. Construction details are beautiful and strong with highly polished high carbon stainless steel blades, polished nickel silver bolsters, and handle slabs of rosewood. Harvested from Central America southward to the Amazon basin, this dense tropical hardwood contains so much natural resin that it resists water and heat stress without changing its shape. Rosewood is one of the best knife handle materials -- hard use and an occasional drop of oil are the best treatment. The slip joint style is light duty but still very popular. Just be careful when using the knife for piercing, since pressure in the wrong direction folds the blade back toward the handle. Opening either blade is a two-handed task. The 2.4-ounce Muskrat is entirely American-made; all knife parts used by Bear & Son are manufactured in their own facility.